Chinese Premier Li Keqiang and his Russian counterpart Dmitry Medvedev met in Beijing on Tuesday, agreeing on closer cooperation and stronger ties. 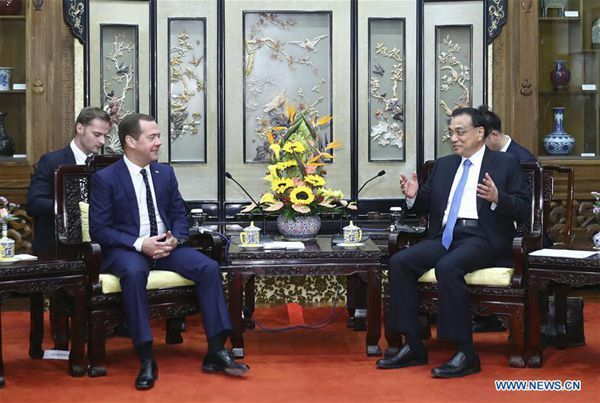 Medvedev is the first foreign leader to visit China after the 19th National Congress of the Communist Party of China (CPC). "This has shown the closeness and high level of China-Russia ties," Li said. China is ready to consolidate trust, expand cooperation and exchanges with Russia, to bring cooperation visions into reality through Prime Ministers' Regular Meeting as well as other cooperation mechanisms, Li said. Under the new circumstances, China will further deepen reform and opening-up, nurture new driving forces, and share development opportunities with countries around the world, said the Chinese premier. Li also briefed Medvedev on the 19th CPC National Congress. Medvedev congratulated on the success of the congress. Hailing Russia-China comprehensive strategic partnership of coordination as "high-level" and "future-oriented", he said Russia expects joint efforts with China for greater progress of cooperation. Medvedev is on an official China visit from Tuesday to Thursday. Li and Medvedev will hold the 22nd China-Russia Prime Ministers' Regular Meeting on Wednesday.